More respondents in Poland (around 30%) than in Eastern Europe (around 20%) are concerned about a worsening of the DSO figure over the next 12 months. In line with observations in all of the countries surveyed in Eastern Europe (except for Hungary), respondents in Poland appear to be highly more inclined to request payment from B2B customers using methods which do not expose them to the risk of payment default. Next to Slovakia, the country least prone to grant credit terms in B2B trade (on average 27% of B2B sales were made on credit), Poland has a strong risk-averse stance. On average, around 35% of the total value of Polish respondents’ sales to B2B customers was transacted on credit (2015: 28%). This is slightly below the survey average of around 40% and significantly below the 44% B2B credit sales value observed in the Czech Republic or the 54% recorded in Hungary. Hungary is the Eastern European country most inclined to use trade credit in B2B sales. In contrast to what was observed in the other countries surveyed in Eastern Europe (except for Turkey), respondents in Poland appear to be more trade credit friendly with domestic than with foreign customers. 37.5% and 30.3% of the total value of respondents’ domestic and foreign B2B sales was made on credit (averages for Eastern Europe: 42.9% domestic and 36.6% foreign). This is likely to reflect Polish respondents’ perception that the risk of payment default is more likely to arise from credit-based sales to foreign than to domestic customers. Around 85% of respondents in Poland, reported late payment of invoices by domestic and foreign B2B customers over the past year. This is consistent with the percentage of respondents in Eastern Europe and resulted in an average of around 34% of the total value of B2B receivables remaining outstanding past the due date. This percentage, which is well below the average for Eastern Europe (around 43%), is the lowest default rate of all the countries surveyed in the region. Late payment by domestic customers was reported to occur slightly more often than that from foreign customers. Compared to last year, both domestic and foreign default rates in Poland recorded an increase, which is below the average increase for the region. Late payment of domestic and foreign B2B invoices in Poland is reflected in the Days Sales Outstanding (DSO) figure posted by respondents. This averages 71 days (above the 57 days survey average, and the highest recorded in Eastern Europe) and is nine days shorter than last year. This decrease may reflect higher efficiency in collecting high value invoices. More respondents in Poland (around 27%) than in Eastern Europe (21.5%) expect an increase in the DSO figure over the next 12 months. Fewer respondents in the country (59%) than in Eastern Europe (nearly 66%) expect no change in DSO over the same time frame. Among the number of challenges that are likely to impact Polish businesses’ profitability this year, the collection of outstanding invoices is the one that worries respondents in Poland (12.4%) more than those in Eastern Europe overall (10.5%). Payment terms extended to domestic B2B customers by respondents in Poland average around 25 days from the invoice date. These are below the averages for Eastern Europe (30 days) and are among the shortest observed in the region, along with those observed in the Czech Republic and Hungary. Foreign customers of Polish respondents are requested to pay invoices on average five days later than domestic customers. This is almost one week below the average payment terms for Eastern Europe. Over the past year, the average domestic payment terms did not vary, whereas the payment terms extended to foreign customers increased by two days only. Despite no variation in domestic payment terms, and slightly longer terms extended in foreign trade, Polish respondents had to wait four and seven days longer than last year to receive payment on overdue invoices. This means that, on average, overdue invoices were settled by domestic customers within one month past the due date, and by customers abroad within three weeks overdue. Polish respondents could turn past due receivables into cash, on average, nearly two months after invoicing. This is in line with the average for Eastern Europe (52 days). 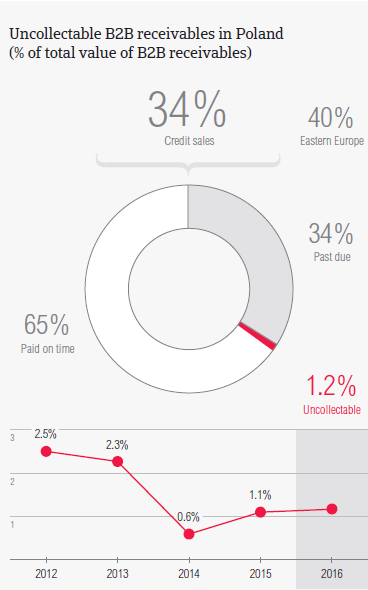 Almost the same percentage of respondents in Poland (63.5%) as in Eastern Europe (64.4%) reported that domestic B2B invoices are paid late by customers due to liquidity issues. The percentage of respondents stating this delay factor has increased compared to one year ago. Consistent with the survey pattern, the second most often cited reason for late payment of domestic invoices is the intentional use of outstanding invoices by B2B customers for their financial advantage. This was cited by more respondents in Poland (39.6%) than in Eastern Europe (nearly 33%). Compared to last year, there was a 6% increase in the percentage of Polish respondents citing this. More respondents in Poland (26.4%) than in Eastern Europe (23.8%) said that late payment from foreign customers is most often due to the complexity of the payment procedure. Foreign late payment due to the intentional use of outstanding invoices for financial advantage was cited by more respondents in Poland (24.2%) than in Eastern Europe (21.3%) overall. As a consequence of late payment, 23.3% of respondents in the country (27.2% in Eastern Europe) reported that they had to postpone payments to their own suppliers. Interestingly, more respondents in the country (18.3%) than in Eastern Europe (12%) reported that they defaulted on payments to their own suppliers. Therefore, protection against the risk of payment default becomes of paramount importance to businesses. In order to do so, more respondents in Poland (30%) than in Eastern Europe (23%) will check customers’ creditworthiness more often over the next year. 28% of respondents in the country (compared to 18% in Eastern Europe) will request a secured form of payment from B2B customers over the same time frame. The proportion of B2B receivables, reported by Polish respondents as uncollectable, is in line with that at regional level (1.2% of the total B2B credit sales value). Uncollectable receivables consisted almost entirely of domestic write-offs. Uncollectable domestic B2B receivables originated most often from the construction and consumer durables industries. Around 54% of respondents in Poland (same percentage in Eastern Europe overall) reported that B2B receivables were uncollectable mainly due to the fact that the customer went bankrupt or out of business. More respondents in Poland (28.6%) than in Eastern Europe (21.6%) reported that B2B receivables were written off as uncollectable primarily because the debt was too old. This finding is consistent with what was mentioned earlier about the DSO figure and the challenges to business profitability in Poland. Survey respondents in Poland reported granting trade credit terms mainly to B2B customers in the construction, consumer durables and services industries. Invoice payment terms extended by Polish respondents to B2B customers in the construction industry are significantly longer than the country average (around one month from invoicing). Despite lenient payment terms, B2B customers in the construction industry settled overdue invoices the slowest (over two weeks after the due date) and generated an above average (for the country) proportion of past due invoices. According to most of the respondents in Poland (54%), this is likely to be a consequence of liquidity constraints of customers in this industry, as well of the customers’ intentional use of outstanding invoices for financial advantage (44% of respondents). Nearly 40% of the respondents in Poland expect payment practices of B2B customers in the construction industry to deteriorate significantly over the next 12 months. Around 24% expect a worsening of payment practices in the consumer durables industry over the same time frame. No significant change is anticipated in respect to payment practices of other industries. The main strengths of the Polish IT sector are the stable demand, a strong export performance and financial transparency, as the largest IT distributors are listed on the Warsaw Stock Exchange.